By now, most Canadians are well acquainted with Canada's prime minister-designate, Justin Trudeau. Shortly after he became the prime minister-designate, The Mirror, a UK-based newspaper, ran a piece titled "Is Justin Trudeau the sexiest politician in the world?" The name Justin Trudeau appeared in headlines across the globe after his Liberal Party swept to victory in Canada's federal elections, everyone got familiar with this name. At 43, he is the second youngest prime minister to serve Canada and the first son or daughter of a prime minister to follow their parent back into office. 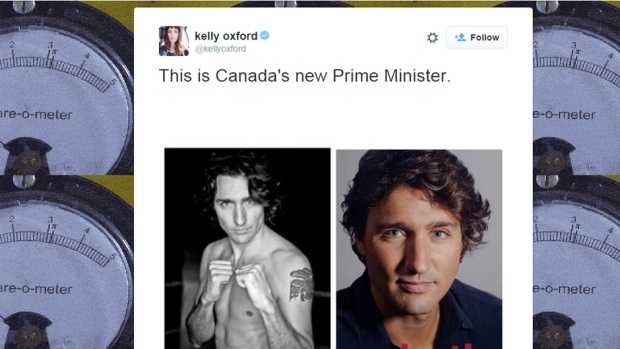 Social Media got overwhelmed by tweets after Trudeau's victory and everyone was amazed to see such a handsome and young Prime Minister. The outgoing politician has declared himself a feminist, promised to protect women's abortion rights and will start work towards legalizing drugs "right away" once he assumes office. It may sound bit awkward but yes he really said so, as they belonged to liberal political party so this may happen, marijuana can be legal. Trudeau was compared to President Obama, who was 47 when he was elected to office and continues to be called a Pilf on Twitter, and John F. Kennedy, who at 43 was the youngest man to be elected to office in the US. Trudeau was himself accused of sexism in 2013 after organizing a ‘ladies night’ event that promised “cocktails, candid conversation, curiosity inducing ideas” and the chance to “really get to know the future prime minister”, with questions for debate including “what’s your favorite virtue?”. Addressing jubilant supporters, Mr Trudeau said Canadians had "sent a clear message tonight: It's time for a change". "We beat fear with hope, we beat cynicism with hard work. Most of all we defeated the idea that Canadians should be satisfied with less. "This is what positive politics can do," he said, also praising Mr Harper for his service to the country. So beyond he looks, after getting the news, Mr. Trudeau also thanked his people while travelling in a subway and greeting people for opting him in his new political role.